Imagine watering your whole lawn without even manually operating the hose and sprinklers. All is possible with the traveling sprinkler rain train that costs no electric or gas power. Powered by only water pressure, the traveling sprinklers irrigate your lawn without any help. Aside from working efficiently, these sprinklers also upgrade the irrigation process. Most of the traveling sprinklers look like a tractor and comprise of seven basic parts. Apart from those parts, there are other factors that you need to check before buying a traveling sprinkler. Hence, to make your work easier, we have reviewed one of the best traveling sprinklers produced by the company Nelson. Since 1911, Nelson is one of the pioneer USA-based producers of irrigation equipment. By providing efficient irrigation tools, the company offers you the best possible watering solutions. Its wide range of product includes hoses, sprays, and other accessories. 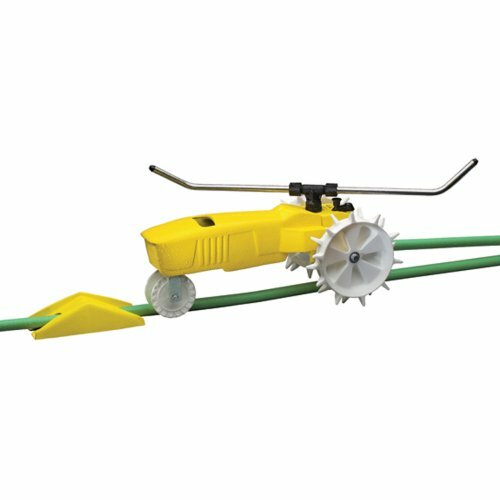 The Traveling Sprinkler Rain Train is one of the most popular and innovative irrigation tools by Nelson. Having a chip-resistant cast-iron body, this product is reliable and long-lasting. Additionally, it has been painted with a powder to add more strength and protect it against corrosion. The rain train is designed to covering an area of up to 13,500 square feet. It travels up to 200 feet, so no matter how large your lawn is, this Rain Train by Nelson can deliver. Its adjustable aluminum arms can cover a varying range of area from 15 to 55 feet in diameter. If you want to keep the diameter small up to 15 feet, simply turn the arms a bit downwards. To cover up to 55 feet, just turn the arms of the rain train up to 30 degrees. In case of windy weather, you can adjust the arms horizontally. Thanks to the cast-iron body, the product is durable. It can also withstand the wind pressure by its adjustable aluminum arms. All of these features add strength to the product. Thus, you can easily rely on this tiny sprinkler for watering your lawn. Forgot to turn off your water sprinkler or hose? Undoubtedly, traditional sprinklers and irrigation methods waste a lot of water, but the Rain Train brings a permanent solution to this problem. With its automatic shut-off feature, you can save water to a greater extent. Hence, if you forget to turn off the water supply while using this rain train, it will automatically turn it off and will save water in return. With Rain Train in your lawn, you won’t have to think about power, gas, or electricity while watering your lawn. The product uses built-in water pressure in the hose to move it around the lawn easily. This self-propelled rain train follows the pattern formed by a hose, so you can choose the way you want your rain train to move. Simply customize the hose pattern, turn on the train, and see your rain train rolling on it. On average, this product covers anywhere from zero to 37 feet per hour. If you want to adjust this traveling speed, you can choose from high, low, and neutral settings. To saturate your lawn completely, you can select LOW on selector knob. If you want to water your lawn lightly, you can select HIGH on the selector knob. Lastly, if you want to maintain the average saturation and traveling speed, you can select NEUTRAL on the selector knob. Measuring 9.2 x 1 x 20.2 inches but with a weight of approximately 17 pounds, this product can be moved around easily. Plus, you can conveniently assemble the product due to its compact size. The Nelson Traveling Sprinkler Rain Train is available in bright yellow color which makes it stand out among your all-green lawn. If you are on the lookout for an easy and faster way of watering your lawn, you can easily bet on the Nelson Travelling Sprinkler Rain Train. Its sturdy body smoothly irrigates your whole lawn, while its auto-off system allows you to save water. Featuring the adjustable speeds and arms, this product is easy to assemble and use. You can not only cover a large area in your lawn, but it can also help you reduce the use of water. Additionally, you won’t need any form of power sources for this to work; you just need to buy a dedicated water hose. To make it a perfect buying guide for you, we have also compared our selected product with a somewhat similar option available in the market. The comparison with the Orbit Travelling Sprinkler will help you know the difference between the products. Firstly, both of the brands offer self-propelled traveling sprinklers. Like Nelson’s, the Orbit Travelling Sprinkler also features three traveling speeds and adjustable arms. However, if you turn the arms of the latter product wrongly, it can go backward. That means you will have to struggle a bit when adjusting the arms of Orbit’s to make it go straight. Secondly, both products use a similar principle to function, but the Orbit Travelling Sprinkler is a bit heavier than our selected product. Also, it is quite larger than the Nelson Traveling Rain Train, making Nelson’s sprinkler win the race in terms of size and weight. Lastly, the Orbit Travelling Sprinkler features a bright green color. Though the color is quite cool, it can be difficult for you to find it in your green lawn. Is your lawn exceptionally large? Or do you have a garden that needs regular watering? Do you hesitate watering it? With the rain train by Nelson, you don’t have to worry about irrigating your plants in your garden or grasses on your lawn. Simply set it up or assemble, adjust the speed and arm, and wait for it. To sum it up, the Nelson Traveling Rain Train is one of the most cost-effective irrigation solutions today. Thanks to it, now you can water your lawn or garden in a breeze.